You love the mountains in the summer and winter, and always, when you have the opportunity you pop round the Pirin Mountain. You visited the Bansko region, went sight-seeing, but when the time for ski comes, you know – your destination is again the resort town. We also love the winter in Bansko. We love its white tracks, the quiet evenings by the fireplace, heart-to-heart talks with friends on a glass of red wine in one of the taverns in the resort town. We enjoy the incredible cozy spa hotels, the warm mineral water, the tasty, home Bansko cuisine. If this year as well you have already planned to spend your winter vacation in the resort town and you are yearning for new challenges, perhaps we will be able to surprise you by offering you to spend one day enjoying the beautiful views that are revealed at the Yavorov chalet. 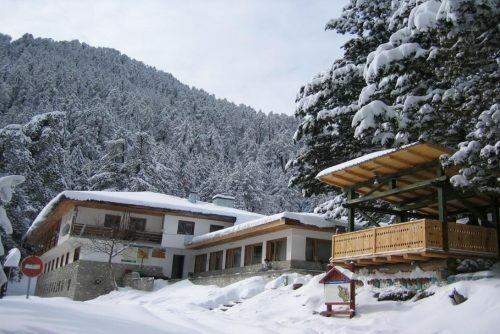 Located at 1740 meters altitude, on the western slope of the circus Razlozhki Suhodol, and only 7 km away from the neighbouring-to-Bansko town of Razlog, chalet Yavorov is one of the most popular and well-equipped rest-houses not only in the Pirin Mountain but also in the whole country. In fact, the chalets which bear the name of Yavorov are two – the old one and the new one. The old rest-house was built in 1933. by the initiative of the Kresna-Razlog Tourist Association. In 1929, the members of the “Pirin” Tourist Association in the town of Razlog gathered and decided to build a rest-house to accommodate anyone who wants to enjoy the beauty of the Pirin Mountain. The money for the building was provided through donations and the building was erected by voluntary labour. When it officially opened in 1933., the volunteers decided to give it the name of “Peyo Yavorov” as the poet lived in that region for many years, and as a rebel, fought for its freedom. The old chalet exists today as well and has a capacity of 20 seats. In the building, there is a sewerage system and running water, it is electrified and there are a tourist kitchen and a canteen to it. The only inconvenience is that the sanitary units are external. The new chalet is located in immediate proximity to the old one, and it has the capacity to accommodate 70 tourists. The construction of the new building started in 1976, and its official opening was in 1982. Here, as well as in the construction of the old chalet Yavorov, voluntary labour was used but in the financing of the project, the state took part as well. The new building has six double rooms and one apartment with own sanitary unit, four triple and general rooms without a private bathroom. If you are the type of people who do not like cooking, when they are on holiday, the chalet has a very nice and cosy restaurant where they offer delicious home-cooked meals. Both the old and the new chalets are open throughout the year and are ready to welcome you whenever you decide. However, it is good, before you take upwards to connect with the chalet keepers to have peace of mind that if you want to stay, there will be rooms available. If you do not have the intention to stay for the night, but only want to enjoy the beautiful views that are revealed from the region of the Meadows (where the chalet Yavorov is located) or you have decided to try out your strength on some of the numerous tourist routes, which pass the Yavorov chalet, then you can simply put on your shoes and the rucksack, and set out for the mountain trails. Before we start the tour around the routes to the chalet, you have to know the following: Although the way to the chalet can be traversed in the winter as well, if you are not prepared and trained for such transitions, the better decision is to postpone the transition for the spring or the summer. If you are keen mountaineers and the winter in Bansko and the surrounding areas does not scare you, then, here are a few popular routes that you can try out yet this winter. You can reach from Bansko to the chalet the most easily, if, after the exit from the town, you take the way to Simitli. You will reach a road fork, where there is a sign for Betolovo. You should take that way and follow the road. You will get to the information signs of the National Park of the Pirin, where you should leave your car and take the trail marked in yellow. At the beginning, the climbing goes alongside the river, and then you simply have to follow the marked trail, that within about an hour-hour and a half, will take you straight to the chalet Yavorov. This route has the least degree of difficulty and you can pass it without any problem in winter conditions as well. If the previous route seems too easy for your potentialities, the walk from Predela to Yavorov chalet will surely raise your adrenaline level. This route is more difficult and we again repeat, if you do not have the training for winter hiking, do not take it. If however, you decide to get to the chalet through Predela, from Bansko, you have to take into the direction of the Kulino region. Thence you must continue on foot. You are in for quite a steep climbing-up to the saddle between the ‘Bezimenen’ (Unnamed) and Dautov peak. If you manage to cope with the load after you pass the saddle, a rather more enjoyable descent to the valley of the Okadenska river follows. The trail follows the way of the river, but it is lost in places, so you must not ease your attention. Following the marking, you will get to the Yavorov chalet in about 6 hours. The chalet is the starting point of many of the routes to be visited, on the Northern ridge of the Pirin Mountain, but because the time will not be enough to make you familiar with all the popular routes, we have chosen one of them – from the Yavorov chalet to Vihren chalet. This route is difficult (not to say extreme), so even during the summer, it is only recommended to people who are well-trained. We will share it with you only informatively (so that you can consider it when you come to Bansko in the summer). The length of the route is about 12 km, and the time that it takes to be traversed is about 10 hours. The difficulty as we shared a while ago is quite high. From the Yavorov chalet, the route goes to the mountain ridge, following a trail marked in red and yellow marking. At the beginning, the trail is with an affordable displacement, and passing it is not particularly difficult. After about an hour of normal pace, the Bunker shelter is reached, and after another one hour, you reach the Suhodolsko lake. 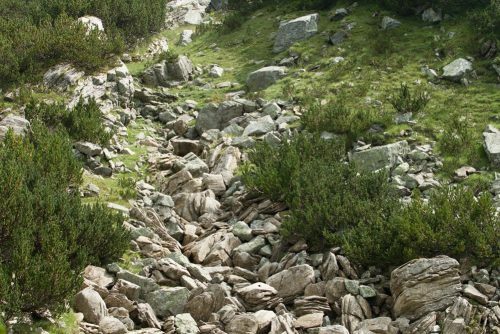 When you pass the lake, the trail becomes quite steep, and in places, it is with large sections of moraines (if you have climbed the Cherni vrah peak, you know how unpleasant and difficult to pass the moraines can be). Climbing up from the lake to the Okadenski hill takes about an hour and when you get to it, you must look around very carefully where to take to. See and follow the marked in red trail, since it leads to the shelter Koncheto (the Horse). At this stage, the trail goes to the Marble ridge (Mramornoto bilo), it shortcuts Razlojki Suhodol and peak Bayovi dupki (Bayovi holes), and after quite a difficult climbing, you will get to the shelter Koncheto. This is the most beautiful part of the route and exactly in this place normally everybody gets rest, enjoys the views and of course – makes their photos. After the deserved rest, you will have to get up and take to the last stage of the route – the Vihren chalet. You have to get to the Banski Suhodol, but be very careful, as in places the marking is lost, and you can easily lose your way. When you get to the top, the views to the saddle Koncheto (the Horse), which will reveal in front of you, will leave you speechless. However much you get entranced though, watch your steps and do not leave the group. The downhill is steep and at moments dangerous, but if you take care, everything will be fine. So, following the marking, you will shortcut the peak Kutelo and will get to the saddle Premkata. Here you can already take a rest because the trail is easier and even. 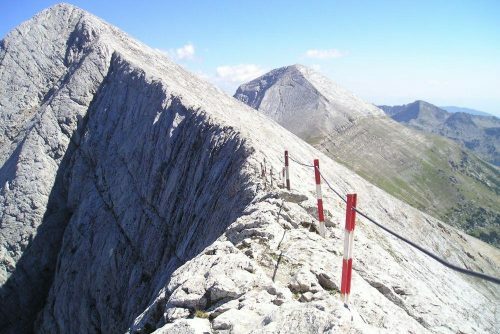 Gather strength, because you are in for one last steep climbing to the Vihren peak (anyway you have come here, you can spend another 30 min to conquer the highest peak in the Pirin Mountain). When you reach the peak, take rest, and you can take down to the Vihren chalet. The chalet, you can reach by several routes, but the best option is to take the classical route, following the tourists who you will surely meet along your way. The opportunities that the Yavorov chalet provides for full relax are really a lot, and it depends only on you whether you will walk from Bansko to the chalet to have a cup of tea, whether you will stay overnight, whether you will descent to the ski slope or will try out your strength by choosing to overcome one of the many routes that start from the Yavorov chalet. More important is that by choosing to spend the winter in Bansko this year, you have one more opportunity to really enjoy, and as well as you like at that. The route Yavorov chalet – Haydushka cheshma (Haydushka mountain) (40 min), “the Feet” (60 min), the spring of Byala Reka river (2 hours) and many others. It is time to change this! Bansko awaiting you this winter as well!